—Excerpt from The Dark Young Man. Jacob Dinezon is considered by many to be, “The greatest Jewish author you have never heard of.” He was a leading figure in Russian Jewish literary circles at the turn of the 20th century. When The Dark Young Man was published in 1877, it was considered the first realistic Jewish romance novel. It became a bestseller. 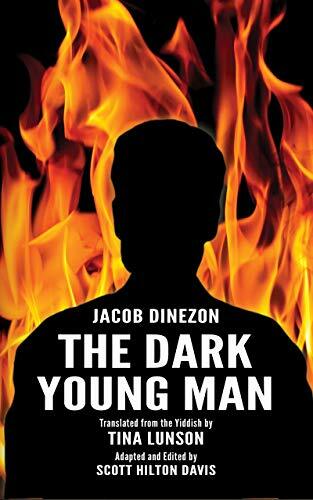 Now, coinciding with the 100th anniversary of Dinezon’s 1919 death in Warsaw, Jewish Storyteller Press is publishing the first English translation of The Dark Young Man. The most highly acclaimed writers of modern Yiddish literature are Sholem Abramovitsh (Mendele Moykher Sforim), Sholem Aleichem, and Isaac Leybush Peretz. They are commanding and well known as novelists with a focus on the Shtetl, the small Jewish communities scattered across Russia and Eastern Europe. These are the stories that inspired Fiddler on the Roof. Almost anyone well versed in Jewish and Yiddish literature can name and successfully discuss their works. Far less is known about Jacob Dinezon, who produced similar literature overlapping this well known period in Jewish fiction. Dinezon’s characters represent the duality of life in the Shtetl—common people attempting to reconcile a life of poverty and discrimination against traditional Jewish values and religious obligations. It is considered the first bestselling novel in Yiddish. In The Dark Young Man, Dinezon delivers a fascinating tale of love, loss and intrigue in the Jewish section of an urban city in the Russian Empire. The protagonists are Yosef, a poor tutor living in the home of a wealthy merchant and the merchant’s two daughters who fall deeply in love with Yosef. Yosef and Roza are madly in love in a time when arranged marriages exist and Yosef is far too poor to be considered an appropriate candidate. Roza’s younger sister, Rukhame, is also deeply in love with Yosef, who is there only to tutor them. A fourth protagonist, Meshe Shneyur, is the wicked “dark young man.” He marries another sister of the family and plots relentlessly to take over the family business by ruining the reputation of Yosef. To accomplish his mendacity, Meshe must find a way to make Yosef a criminal. He eventually plots to have counterfeit money placed into Yosef’s hands, resulting in his arrest. He then manipulates to have an arranged marriage with Roza to an idiot, making it easier to take over the family business. Yosef rots in a St. Petersburg jail cell while Roza’s arranged marriage takes place. What will become of the despondent Yosef, whose soulmate is now unhappily married? How can Roza or Rukhame help poor Yosef, languishing in a dark prison cell? Ironically, Jacob Dinezon was living in the home of a wealthy Jewish family as a tutor when he wrote this story. Perhaps it was more of a memoir than a novel. Dinezon’s writing is poignant and haunting; his characters are bright, intense, and unforgettable. Like many Jewish authors of his time, Dinezon explores the daily lives of primarily poor and subjugated Jews who live in obscurity beyond the Russian masses. In doing so, he displays the unique character of these physically disparate, but socially similar societies. The Dark Young Man contributes immensely to the quality of Yiddish literature in this period. Friend and advisor to almost every major Jewish writer of his day, Jacob Dinezon is truly a giant in Yiddish literature. Charles S. Weinblatt was born in Toledo, Ohio, in 1952. He is a retired university administrator. Mr. Weinblatt is the author of published fiction and nonfiction. His biography appears in the Marquis Who’s Who in America, Who’s Who in American Education, and Wikipedia.